Cathay Pacific's order for 21 777-9X aircraft will give the carrier a lead in fleet re-generation in Asia, a position it badly needs to occupy after falling behind the curve in replacing ageing A340-300s and 747-400s. Cathay has acutely felt the impact, but now becomes yet another carrier to order the 777X alongside the A350-1000, showing airlines see segmentation between the types. For Cathay, that means using the 777X on its strongest long-haul routes – from both a passenger and freight position – such as to New York, London and Los Angeles. The 777X order gives Cathay greater future lift than the A350, which had exclusively comprised Cathay's delivery stream after 2015. Cathay is the largest 777-300ER customer in Asia, and second in the world only to Emirates. 41% of the world's 777-300ERs are in Asia-Pacific, which is home to 30% of 777-300ERs on order. Other large customers in the region include Singapore Airlines, Korean Air, All Nippon Airways and EVA Air. Cathay's 777X order starts what will surely be a healthy sales effort in the region as Asian carriers like to keep their fleet young. Already ANA is in advanced 777X evaluation stages. EVA has flagged future 777-300ER orders while later evaluating the 777X. Cathay's 777X order provides it with large-capacity aircraft for the future. Prior to the order, Cathay only had A350s on order for delivery after 2015. In 2014 and 2015 Cathay is due to receive its last 777-300ERs, including nine in 2014 and six in 2015 (including three ordered on 27-Dec-2013). While the A350 is a large-capacity widebody aircraft, even its largest variant, the A350-1000, will be slightly less capable than today's 777-300ERs. The 777-9X is planned to be slightly more capable over today's -300ER while having about 20% lower fuel consumption. Cathay has 38 777-300ERs in service and they fly on the carrier's key long-haul routes, such as to New York, Los Angeles and London. These routes carry large volumes of passengers and cargo and feature prominently in the carrier's network: London went up to a fifth daily service in 2013. The A350-1000 would have come in under the carrier's requirements on strong -300ER routes. Note: On 27-Dec-2013 Cathay announced an order for three additional 777-300ERs to be delivered in 2015, and one 747-8F to be delivered in 2016. Six long-haul routes (London, New York, Los Angeles, San Francisco, Vancouver and Toronto) feature on the ranking of the carrier's top 10 routes by ASKs. While most of Cathay's flights are at or under four hours, there are about 110 weekly flights with a scheduled duration of over 14 hours. A key question surrounding the mammoth aircraft orders from Gulf carriers at the Nov-2013 Dubai airshow was how many are for growth and how many for replacement. That question is also pertinent to Cathay. There are many moving parts to the equation and any answer today is only preliminary, likely to be revised many times. For Cathay the question is especially tricky given the uncertainty of if - or when - Hong Kong's third runway will open. While congested Hong Kong in the next few years will likely enter a period of limited to no movement growth, any small movement growth could enable Cathay to grow its network, including long-haul where these 777-9Xs will be deployed. Alternatively, early 777-9X deliveries may slanted towards replacement of 777-300ERs while those after the opening of the third runway (possibly around 2023) are for growth. There will inevitably be replacement of -300ERs for Cathay. 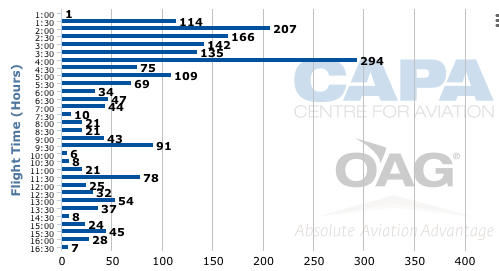 In 2021, when Cathay's -9X deliveries are due to start, the carrier according to CAPA's Fleet Database will have 18 -300ERs that will be at least ten years old (provided there are no early lease returns). With time, the replacement/growth balance will become evident. With that will likely be top-up orders for the 777X and/or A350. Cathay's 777X order is also important when considering the broader market. Cathay fell badly behind on replacing its A340-300s and 747-400s, the latter of which had particularly impacted the carrier's financial performance in 2012, with oil prices around USD100. In mid-2012 as market weakness and higher fuel prices became apparent while Cathay's 747s were coming up for expensive maintenance checks, Cathay accelerated its 747 retirement. It pulled down some long-haul frequencies to have 777-300ERs replace 747-400s. The more fuel-efficient 777-300ER saw some routes shift nearly overnight from being unprofitable to being very healthy. Cathay was a late adopter of the 777-300ER, receiving its first 777-300ER in mid-2007, by which point Singapore Airlines already had nine in operation. Cathay will operate 747s into the middle of the decade (but passenger versions are already being withdrawn from long-haul flights) whereas Singapore Airlines retired its last passenger 747 in 2012. Even Cathay's equity and strategic partner, Air China, will likely retire its 747s before Cathay. Other Asian carriers are at various stage of 747 retirement (the -400 is long gone from ANA and JAL but still present at carriers including Malaysia Airlines and Thai Airways), but those that still have 747s largely wish they had more fuel-efficient options. With 11 A340-300s, Cathay is the largest A340 operator in Asia. Only Air France, Iberia and Lufthansa have larger A340-300 fleets – and those carriers are challenged by profitability. Cathay will reverse this late re-fleeting trend by being an early adopter of the 777X. Some aircraft may be used for growth while others will be for replacement, giving Cathay a large advantage. This will be critical as competition increases, including from once-sleepy carriers taking a larger role, especially in the popular, growing and profitable trans-Pacific market. The lower cost base made possible by the 777X will give Cathay a strong advantage over its growing number of formidable competitors – such as EVA Air and mainland Chinese carriers. The 777-300ER flies about a quarter of all trans-Pacific flights. Cathay has secured valuable early delivery slots, taking 21 777Xs from 2021 to 2024. Boeing expects 777X deliveries to start in mid-2020, and Cathay, as usual, will avoid taking the first production aircraft and the teething problems they often suffer. Early slots was a key driver in Cathay's 2012 purchase of the A350-1000. With Emirates, Etihad, Lufthansa and Qatar Airways placing large 777X orders already, 777X production is effectively accounted for in its first few years. Boeing will likely be able to squeeze in a few customers, but it is unlikely for one of Cathay's competitors to be able to secure a large 777X fleet in the same early period as Cathay. This gives Cathay a considerable lead period, with numerous benefits across the operation. For example, Cathay may be able to launch in the 777X a new premium product, critical for it to maintain its position as one of the world's leading premium carriers. Competitors would either have to fly with an outdated product or conduct an expensive retrofit programme. Cathay Pacific will halve its passenger 747 fleet during 2014. Cathay is due to start the year with 13 747-400s and end the year with seven. Assuming a one-to-one replacement of 747-400s with 777-300ERs, and given Cathay's plan to retire six 747-400s and take delivery of nine 777-300ERs in 2014, there will be a net gain of three long-haul aircraft in 2014. These have started to be allocated with a new service to Newark and additional frequencies to North America. Cathay has often been able to advance retirement of a few 747s, so Cathay could likely end 2014 with less than seven 747-400s if it able to manage it. With 747-400s largely to be withdrawn from long-haul passenger routes by the end of 2014, the six 777-300ERs for delivery in 2015 imply long-haul passenger growth as there will be no long-haul 747-400 routes to replace and Cathay's fleet plan says the expiry of 777-300ER leases does not start until 2017. This is a remarkable and fast decline considering Cathay's 747-400 passenger fleet peaked in 2007 with 24 frames (including some awaiting conversion to freighter standard). 2010 and 2011 saw the fleet decrease by one frame each year, but the major reductions started in 2012 when three aircraft left the fleet. 2013 saw five aircraft leave the fleet. The freighter fleet had been retired slightly earlier owning to the new 747-8F. 2013's exit of five 747-400s will be topped by the exit of six 747-400s during 2014. The remaining seven 747-400s are due to be retired by 2017, but this could be accelerated, especially now that Cathay on 27-Dec-2013 placed a top-up order for three 777-300ERs for delivery in 2015. Differentiation between competing models is becoming more subtle as airlines focus more carefully on route specifics, helping explain why Cathay becomes the fifth 777X customer and fourth 777X customer to have also ordered the A350-1000. 777X customers Emirates, Etihad and Qatar have also ordered the A350-1000; Lufthansa has not but does have the A350-900 on order. Airbus sought to position the A350-1000 as a 777-300ER competitor, but Boeing moved to make the 777-9X, the -300ER's replacement, more capable. Rather than choose one or the other, carriers so far are seeing that with large fleets they can segment their needs. The A350-1000 becomes a powerful twin capable of thinner major routes while the 777X does the heavy-lifting. At the time of Cathay's A350-1000 order, CEO John Slosar called the A350-1000 an “irresistible proposition ... [and] allows us to go non-stop just about anywhere in the world we can go”. He noted its strong cargo capabilities and overall close competition to the 777-300ER, which Cathay had unsuccessfully sought to acquire more of – perhaps a reason for spruiking for the A350. In a statement announcing the 777-9X order, the attraction returned for Cathay's long-haul workhorse, with Mr Slosar saying: "The 777-300ER has done a superb job for us." At the time of its subsequent 777-300ER and 747-8F top-up order, Mr Slosar said in a statement: "These two aircraft types will form the backbone of our long-haul passenger and freighter fleets through to the end of the decade.” This seems to apply – at least for now – a more limited long-haul role for the A350, especially the A350-1000. Cathay's order for the 777X is for the -9X, the largest variant and larger than today's 777-300ER. The 777-9X will further narrow the gap between the 777 family and the 747-8i/A380. Cathay has long been hesitant to order those very-large aircraft. Any application at Cathay would likely be limited to a handful of routes, possibly meaning Cathay could not gain scale on a niche fleet. More of a worry is the loss of cargo volume as well as the 747-8i's/A380's larger passenger capacity. While Cathay during peak periods could optimally fill a 747-8i/A380, off-peak periods – and in any, inevitable, downturn – would pose a challenge. This contradicts Cathay's unwritten golden rule of having consistency within and across its business. The large aircraft bring with them too much risk for a risk-adverse airline. Cathay's order for the 777-9X seems to be a final vote against the 747-8i and A380, not that the cards were stacked in the VLAs' favour. However, in an industry of never say never and where airframe manuacturers – and lessors – are eager to fill production slots, lower acquisition prices could change the equation. But this would require a significant, even unprecedented, discount. 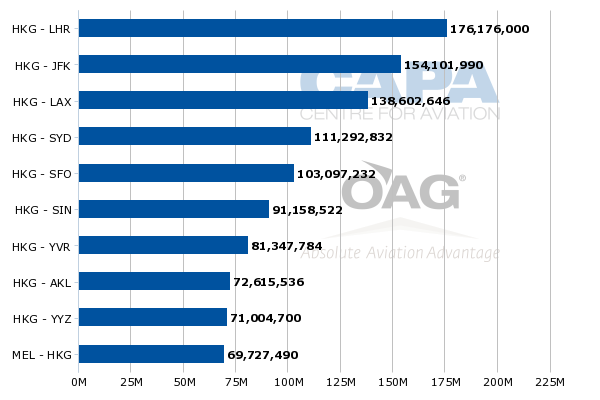 As of Dec-2013, some 41% of the world's in-service 777-300ER fleet is with airlines in Asia-Pacific, according to CAPA's Fleet Database. The region accounts for 30% of 777-300ERs on order with Boeing, giving the region a future share of 37% of 777-300ERs. However, these figures exclude the 777-300ERs announced by China Eastern and China Southern but not yet formally approved. Including these figures, Asia-Pacific will account for 40% of the world's future 777-300ER fleet based on current orders – about the same as today. Many of the region's carriers will be candidates for the 777X. Carriers including ANA and EVA have said they will evaluate the 777X. ANA's order could be in the short-term while other carriers will be eager to order the aircraft soon in order to ensure as early delivery slots as possible. Non 777-300ER customers, like Qantas, could also be candidate 777X operators. However, not all of these carriers will be candidates. Japan Airlines' order for the A350-1000 largely signals that it wants a smaller aircraft than the 777-300ER as its trunk route workhorse. This is the opposite view of Cathay, which requires an aircraft larger. ANA is evaluating the A350-1000 and 777X, but its current thought is that if it ordered the 777X, it would opt for the smaller -8X variant. ANA, like JAL, foresees itself moving to smaller-capacity long-haul aircraft to combat high operating costs and Japan's uncertain economy. ANA and JAL are more comfortable filling smaller long-haul aircraft. A larger aircraft with operating cost improvements is only useful if an airline can optimally fill it. Cathay Pacific, with 38 777-300ERs in service and 15 on orde,r is the largest 777-300ER operator behind Emirates, which has 90 in service and 61 on order. However, Emirates is unlikely to ever operate anywhere near 151 777-300ERs as it will replace some older versions. The next largest 777-300ER operator in Asia, Singapore Airlines, has about half (27) the -300ERs that Cathay operates. Behind SIA are Korean Air, ANA and EVA – all large players in the trans-Pacific market that has largely propped Cathay up in recent times. China Eastern in short order will catapult onto this list with its order for 777-300ERs. The Asian market is becoming more competitive than ever, from possible city-pairs to operating costs, so it becomes critical to find and offer an advantage. Cathay could once rest on its laurels as being one of the few major carriers in Asia, and North Asia especially, but other carriers are now too readily willing to seize that title. EVA Air has quietly emerged as a strong trans-Pacific player while Chinese carriers will grow their position. Agility is a factor Cathay is seeking to re-gain after losing it with 747 and A340 retirement. By the time China Eastern takes its last 777-300ER, giving it a fleet just under half that of Cathay's, Cathay will be preparing for its first 777X, allowing it to leapfrog competitors – at least for a few years. Beyond that is a matter for another day. For now, moving early on the 777X is good, but for a word of caution may not necessarily indicate a faster pace at Cathay.